High Hopes Auctions & Appraisals was founded by Jeffery Mullins, GPPA to take advantage of his experience in the Antique & Auction Marketplace. 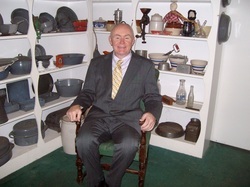 Jeff has over 30 years experience in Antiques & Auctions. Initially the business started out part time and has since turned into a successful full time operation marketing Southwest Virginia Estates, Real Estate and Business Liquidations through the Auction Method of Marketing. The firm also offers a written Insurance & Estate Appraisal Service as well as Estate Inventory Service. Jeff holds a B.S. Degree from the University of Virginia at Wise a A.S. from Southwest Virginia Community College and a GPPA from the National Auctioneers Association. He is a graduate of Mendenhall School of Auctioneering in High Point N.C. He is a member of the Virginia Auctioneer Association and the National Auctioneers Association. He has been guest speaker for seminars on Antiques, Auctions and Collecting Coal Mining Antiques; most notably at the Virginia Highlands Festival in Abingdon, VA. The Mission of High Hopes Auctions & Appraisals is to provide clients with the highest quality Real Estate, Antiques & Estate Auction Services available. We do this by honesty, integrity and professionalism. Our success is measured by the ultimate satisfaction of our customers, our associates and all with whom we do business.